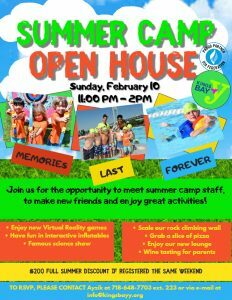 Join us for our 2019 Kings Bay Y Camp Open House. Firstly, meet our amazing Summer Camp staff. Secondly, reunite with your friends and make the new ones and remember that Kings Bay Y is your second home. Thirdly, and most importantly, have a great time on our inflatables, be on top of our climbing wall, make sure you check our drone’s corner. Moreover, enjoy our new activities and video games in our new teen lounge. In conclusion, parents enjoy our new lounge and have some wine tasting, while you wait for the kids.